Hawaii is an epicenter of delicious food. Everywhere you look and smell, something tasty calls your name and you have no choice but to find and devour it. Many of Hawaii’s speciality foods are beach friendly – a culinary collection of dishes that are easy to transport, wrapped in plastic or foam and eaten with hands or disposable chopsticks. Among the vast smorgasbord of pure gastronomic wonders that Hawaii is credited for, nothing is as iconic or more recognized than a little handheld device known as the SPAM Musubi. Masterminded by Hormel Foods, SPAM is a mystery block of pink preserved meat that’s filled with unhealthy amounts of salt and sodium nitrate to create a flavor that’s wildly tasty. 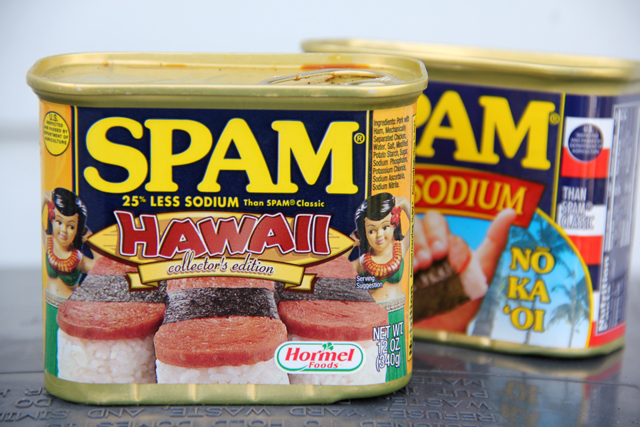 It was during World War II when canned SPAM luncheon meat became popular in Hawaii. 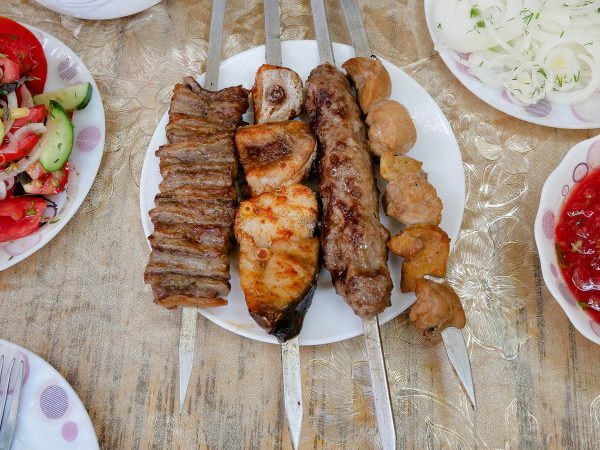 It was relied upon as a vital source of protein paired with a truly delicious flavor. SPAM is eaten in many ways, but in Hawaii it is best enjoyed sliced into pieces, pan fried or deep fried and served with a bed of steamed rice. What is a SPAM Musubi? Genius doesn’t begin to describe the brains behind the discovery of Hawaii’s very own SPAM Musubi. You’ve seen Japanese handrolls – a fresh sheet of crispy seaweed filled with rice and a few other ingredients, wrapped into a cone-like Japanese burrito. 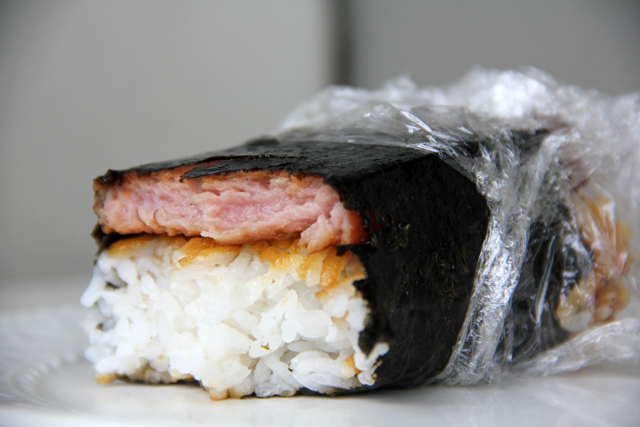 Spam Musubi is an Asian (Japanese) Hawaiian fusion. Just like handrolls, the musubi begins with a sheet of seaweed. Next a scoop of fresh rice is pressed into a rectangular block and a teriyaki marinated slice of SPAM goes on top. The seaweed is wrapped around, blanketing the creation in goodness. 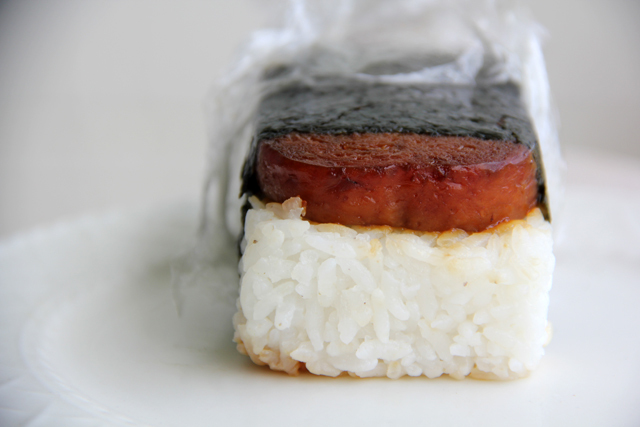 To make it easier, the SPAM Musubi is wrapped in plastic and just like those Chinese hamburger’s, it’s complete. I want you to EAT me! Each bite of musubi consists of salty SPAM meat mingled with grains of plain rice all brought together with seaweed. 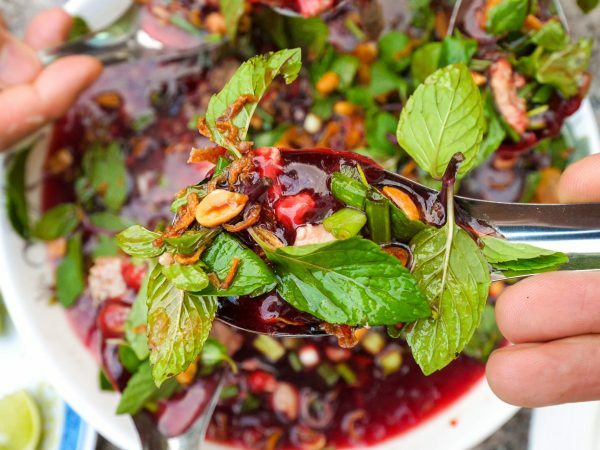 It’s a melt-in-your-mouth sensation that will make your mind dream of Hawaii. A SPAM Musubi is so simple, yet it’s one of the world’s great culinary masterpieces – a creation that need not be modified by any form of molecular gastronomy – but should remain untouched forever. In case you didn’t get a good enough look, here’s another macro shot of the SPAM Musubi. Can you see the sauce and juices oozing together? Hopefully SPAM Musubi will be introduced to the crazier street food scenes of Bangkok or Hong Kong so Hawaii’s discovery will become available worldwide. Oh, also remember to come back to Migrationology of Sunday to see the VIDEO of devouring a Hawaiian SPAM Musubi, don’t miss it! Trust me, you’re going to love SPAM Musubi when you are in Hawaii! 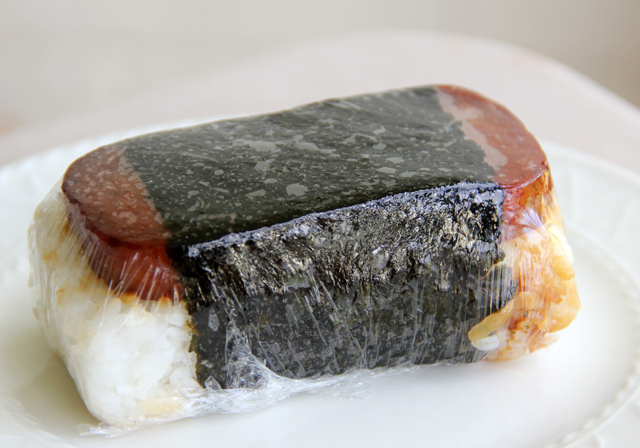 You can find SPAM Musubi all over, at restaurants and convenience stores located throughout Honolulu and Hawaii. 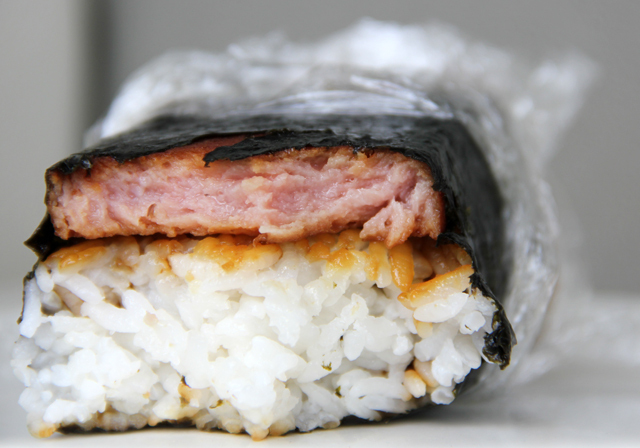 Have you ever eaten SPAM or enjoyed a Hawaiian SPAM Musubi? I’d love to hear your comment (below)! 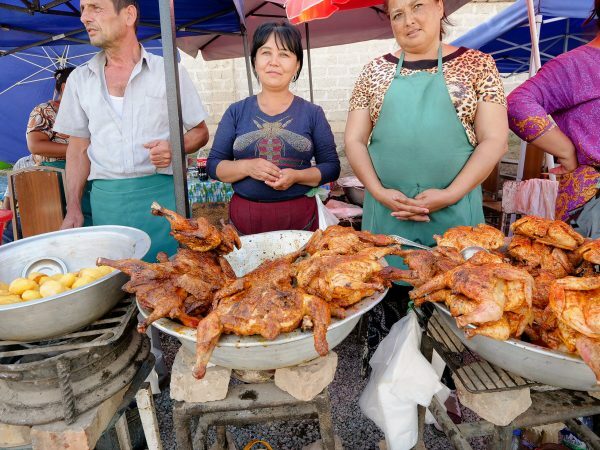 My new Easter tradition… Spam Mushubi. Wish I could post pics. Yummilicous! I have had Spam Musabi and I LOVE It.. The other dishes I love also. When we lived on the Big Island I lost over 50 lbs just by eating the way Hawaiins eat. Hey Ray, great to hear from you and glad you love SPAM musubi too! Love the spam. Going to Hawaii on Sunday (from Aus). Thanks for the vids Mark. Especially the top 16, I’m going to try them all! No problem, thank you for watching Josh. Have a fun eating time in Hawaii! mark: fo realy mike??? ?are u pranking me? What are the chances of this making it to Letterman’s Top 10? Way now! I am gonna make it this weekend for the kids! Glad you shared this! Haha, thanks Vincent! Hope you and the kids will enjoy it – let me know how it goes!